Welcome to Mother Caroline Academy & Education Center (MCAEC). We are delighted that you have taken the first step in learning more about us. Mother Caroline Academy (MCA) is a private, tuition-free school for girls in grades 4-8 from limited financial means. 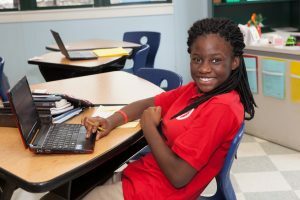 Knowing that education has the power to transform lives, MCA families are invested in setting their daughters on a path of promise that leads to high school, college and a life of opportunity. We have successfully reached hundreds of families of greatest need over the years. Through the support of an incredible community of families, faculty, staff, AmeriCorps volunteers, community volunteers, program partners and investors, MCAEC has opened doors and transformed lives for almost 25 years. We encourage, inspire, and challenge our students to bring forth their best selves so that they may be academically and socially prepared to compete in the 21st century.